Discussion in 'General Chat' started by Chadford, Feb 27, 2013. ...of it's time and a thing of beauty and a feat of engineering. The one VHS that really shouldn't end up on YouTube (or the like). Was it 'home made' or one from a studio? they did screw up occasionally but usually you could just wind the spools to fix it. I remember my Dad had a Betamax Player too... We had a copy of Star Wars: A New Hope on it. I remember by Dad had a Betamax Player too... We had a copy of Star Wars: A New Hope on it. not always kack. i have some that are better quality than some of the older DVDs i have around. i also had a decent VHS player that was bloody good. There's something nostalgic about the fuzzy picture and bleeding colours of old VHSs, they made old horror films look even more sinister (or hid the bad special effects). 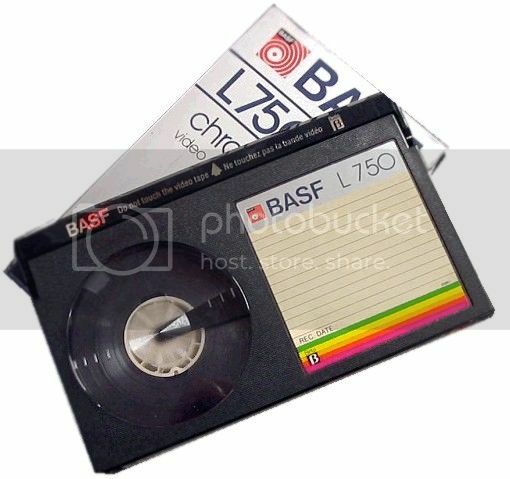 Didn't care for the tape mould though, and if you ran a bad video through your player you would have to run a scotch heading cleaning tape through it a dozen times afterwards. I'm going to have that skeleton song in my head now all day, "re-record not fade away..."
Had a Beta Sony C20 back in '85. On a colour portable it was indistinguishable from a broadcast. Granted the portable was 14"
Beta was much better than VHS for quality. Thinking about it that's probably where my AV fascination took off! Ha ha, That's exactly the same one my old man used to have. God we loved it. Now that is so much cooler than your average DVD player. I mean.....check out all the buttons and digital display. brings back memories of adjusting the tracking or at 8(?) years old having to set the timer as my dad couldnt do it. i remember my dad coming home one day with a ferguson VHS player, similar to the one below but no longplay on it. he also had those terrible book style cases and implemented a list system of what was on each tape. back then anyone could rent any movie as the ratings didnt seem to be adhered to by the local newsagent who stocked movies. i went and got a couple of 18 rated martial arts films with naked ladies and everything. mum wasnt too happy lol. Nothing more terrifying than hitting eject, hearing the whirring, but no cassette appearing. Or the old turtle head trick of it disappearing back inside the player before you could grab it. No thanks, I prefer optical media - superior in every way imaginable. except in the length of time it actually takes to get to the Movie ! Me too. I used to collect Betamax VCRS around 10 years ago. I always wanted the Sony C9 that my Uncle had when I was a kid but was obviously too young at the time to buy one. My first Betamax was also a C20 and it beat the pants off my top end Panasonic VHS that was 15 years newer. I've owned more or less all the Sony models including the HF950 SuperBetamax model. VHS was cool but Betamax was cooler. Many of the DVDs I've had over the years I've collected them (since 2000) don't even have trailers, and frankly, dealing with the studio logo animations, copyright notices, etc takes about the same time it would take to FF through that same crap PLUS the trailers on a VHS. Only with Blu-ray and the more recent DVD releases, since about 2008, have I noticed trailers going into overload. C9 here. Great player. Very low distortion and bleed for a tape player. Side by side with an expensive Panny VHS it blew it clean away. The Panny was a good 10 years younger too. It has a remote that had a cable plugged into the front of the player - first time I'd ever had anything with a remote (must have been 1980 or around then)! I think VHS was one of the most important technological creations ever - loved my video cassettes so much and to be able to record off the TV and rent/buy videos - how cool was that?! i remember buying a sanyo video recorder from the naffi in 82! it had piano key controls on it it didnt last too long so i got my money back! all my next decks were panasonics including the ones were u set the timer using a barcode scanner! happy days!